The most exciting day of the year is approaching. No it’s not Halloween, Thanksgiving, or even Christmas! 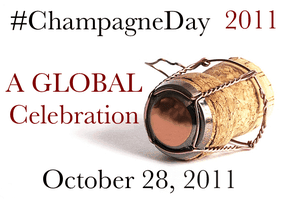 It’s a day celebrating the greatest (and my absolute favorite) beverage on the planet and it’s coming up this Friday, October 28th – Champagne Day 2011, A Global Celebration. A day celebrating Champagne?! Um, yes please! Now in its second year, this event was created by the Champagne Bureau, the U.S. representative of the Comité Interprofessionnel du Vin de Champagne (CIVC), the trade association representing the Champagne houses and grape growers of Champagne. Champagne lovers around the world will be raising a glass of true authentic Champagne in hopes of raising awareness of the need to protect the name Champagne on authentic bottles of said wine. Well, sparkling wines are made all over the world, some of them are absolutely delightful, but real authentic Champagne only comes from the Champagne region in northeast France and should only be labeled as such. Outside of this region it is “sparkling wine” (or other regional specific names – like Cava in Spain, etc. ), yet the name Champagne isn’t officially protected outside of France, and consequently wine is sold throughout the U.S. and elsewhere that is improperly labeled “Champagne” but is not true authentic Champagne. Whoa, wait a minute? So Mary, does that mean my bottle labeled “Korbel California Champagne” isn’t real Champagne? That is correct my friend. That bottle is sparkling wine, but it is NOT Champagne. Therefore this day was created to increase awareness of the importance of proper labeling in the world of Champagne and sparkling wine and to help Americans make more educated decisions when selecting their wine. I am working diligently on posting the first in my Champagne series here, following in the likes of my Bordeaux Series, but until then here are a couple quick things to know as you prepare for Friday. If you are on twitter make sure to follow the hashtag #ChampagneDay to see what enthusiasts around the world are saying about the greatest beverage known to the planet! And, it you are feeling up to it you can even contribute and let the tweeting world know what your favorite Champagnes are and why, or you can just quietly follow along to learn more. If you are on facebook you can become a fan of Champagne Bureau to learn more. If you are lucky enough to be in one of the many cities having a Champagne event, please consider participating! Like, if you are in Napa you can go to this event and I will jealously live vicariously through you. For a list of some of the many events happening throughout the country click here. Stay tuned to this blog for my Champagne 101 series…. For more information on National Champagne Day, a list of events, and how to get involved check out the events website here.